German cymbal company MEINL is entering 2011 with a series of new releases that include new cymbal models for their world renowned cymbal lines, new accessories and even a whole new cymbal line. Within the new releases you can find seven new models of M-Series including 8 ½” bell, 10” splash, 13” medium and 14” heavy hi hats, 16” & 18” heavy crashes and 20” heavy rides. Also included are two new models of Byzance Traditional (16” medium hi hats & 20” extra thin hammered crash), two new models of Byzance Dark (15” hi hats and 22” rides), four new models of Byzance Vintage including 14” sand hats, 16” & 18” trash crashes and 22” sand rides; three new models of Sound Caster Fusion (16” & 18” thin crashes and 19” powerful crash), and the new cymbal line Classic Custom that offers professional sounding cymbals at moderate prices and feature various sizes of splashes, chinas, hi hats, crashes, rides and matched cymbal sets. Five new matched cymbal sets (two Sound Caster Fusion, Classics Custom, Mb10 and Mb8), six new cymbal sets (3 HCS & 3 MCS), new designer cymbal bags as well as artist cymbal bags from Chris Adler & Aaron Gillespie, new cymbal dividers (14” & 22”), new cymbags for all cymbal sizes (6” to 24”), two new practice pads (6” & 12”), two new designer drum rugs (5.25ft x 6.5ft) and many more. A s@#*load of new products to make any MEINL aficionado go insane. Besides all these new additions to MEINL’s catalogue, the company also released their own online magazine, PURE METAL, which will feature MEINL product releases, interviews and news. 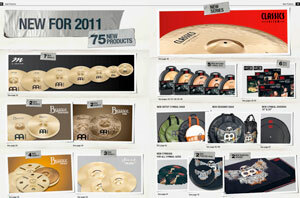 PURE METAL will be updated quarterly so anyone can be on top of what’s happening inside MEINL headquarters.